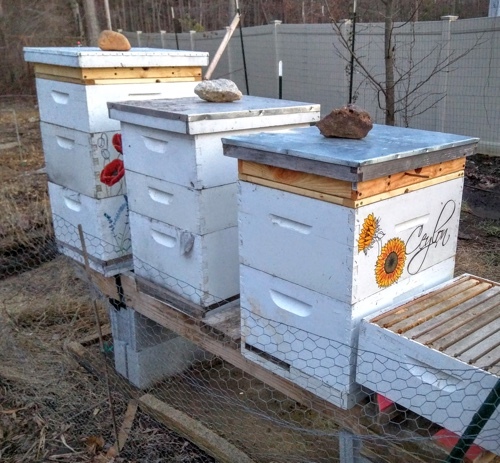 For the first time since 2009, I’ve overwintered 100% of my 3 bee colonies. (MD has the highest rate in the nation of colony collapse disorder.) As I checked mid-March, they were all three alive and queenright and even had frames of honey left. The two largest were churning out brood so fast I had to stick empty frames between full brood frames (“checkerboarding”) to prevent the bees from swarming because of perceived lack of space. The third colony, which was the swarm I rescued last year, is moving very slowly. No signs of disease or pests that I can see visually, but a low brood pattern compared to the others. I’m worried they won’t have enough foragers ready in time for nectar flow (April 15-May 15 in mid-Maryland.) If production hasn’t boomed the next time I inspect, I will have to requeen. Honestly, I should just be proud of them making it through the winter at all. There’s an old saying, “a swarm in July ain’t worth a fly”; it’s probably because a swarm caught in July doesn’t have enough time to build up any sort of stores to survive the winter. But! They’re all alive, and seem happy, and that’s amazing! I gave Ceylon an extra deep box to fill with brood anyway, just in case, and I gave Lady Grey an extra medium box too. Darjeeling was doing so fantastially well that I went ahead and added a queen excluder and a honey super. I’ve started feeding 1:1 sugar water (they use it to make honeycomb, which they need to fill the supers with before they can stuff them with honey.) The syrup will be removed just before nectar flow begins (I don’t want to harvest sugar water instead of honey). If I don’t feed it, they won’t be able to make nearly as much wax comb, which means they wouldn’t be able to store any new honey even if they did bring it in. I heard an interesting recipe from Michael Jordan (aka. The Bee Whisperer) of “A Bee Friendly Company” on how to make their feed a little more nutritious and palatable for the bees. The process is a lot like making tea, steeping things like chamomile, peppermint, lemon balm etc. into the liquid. He then dissolves honey into his. While most beekeepers agree that honey is better for the bees than sugar, I don’t have a source of extra honey. So I used my standard 1:1 cane sugar syrup instead. I also changed the amounts a little because of what I had and didn’t have. Jordan’s recipe for biodynamic bee feed: makes 1 qt. 2 cups good water, bring to boil. chamomile, yarrow, stinging nettle, and peppermint. (Can substitute with 4 drops essential oil each). thyme, lemon balm, sage, echinacea, allspice. (Or 2 drops each essential oils). Steep 7 minutes and strain. Add 1 cup cold water and let cool lukewarm. 8 cups good water & 16 cups cane sugar, brought to simmer & removed from heat. I added 1 tbsp each dried thyme, dry lemon balm, fresh chopped sage & whole allspice berries. Didn’t have echinacea. Wrapped it all up in the cheesecloth and dunked it in the hot syrup & mushed it around for 7 minutes. It became a pretty light yellow. After steeping, I added in the rest of the (cold) water and let sit til cool. Then I splashed in an extra cup of water because the peppermint still smelled very strong. Results? The bees are sucking it down like crazy! They had been taking my simple syrup fairly well before, but this stuff is nearly gone a single day later. Either they suddenly realize they better start making comb right away before nectar flow and they’ll take whatever they can get…. or it’s true that steeping flowers and herbs in the syrup makes it closer to their actual favorite food, flower nectar. Which does make sense. I plan to get the missing ingredients and serve them this faux-nectar (at half strength until I judge results) instead of the “industry standard” plain syrup from now on. Hats off to you, Mr. Bee Whisperer! Thank you! This entry was posted on Wednesday, March 30th, 2016 at 12:39 pm	and is filed under food, homesteading, bees. You can follow any responses to this entry through the RSS 2.0 feed. You can leave a response, or trackback from your own site. Atom, Entries (RSS .92), (RSS 2.0) and Comments (RSS 2.0). 26 queries. 0.314 seconds. Top.